February 2019. My Raspberry Pi image YAPI (Yet Another Pi Image) now includes a facility to send QRSS via pre-made audio files to your SSB rig. Courtesy of Radovan OK1FCX. There is also some desktop shortcuts to assist with creating a QRSSPIG RAMDISK as well as some other useful stuff. Also an on screen keyboard and minor system improvements have been made for minimalist systems. The link for the Raspberry Pi image is here. October 2018. I started playng with Raspberry Pi's this month. I had no real use for one but it seemed like a few people wanted to use them for QRSS grabbers. So I bought one and started to see how I could assist others with QRSS. I compiled QRSSPIG from source and added it to Raspian, as well as WSJT-X, image manipulation software for grab stacking, config files to get RTL SDR dongles running, RTL dongle receiver software and some other stuff. I also included drivers for those funky little TFT displays available for as little as US$9 on Ebay. CHIRP memory programming software is included, AVRDUDE for QRP Labs ATMEL firmware upgrades Grab it while you can. It's 4Gb. I am hoping to make a little write up of the Raspberry Pi on my Google hosted site soon. The link for the Raspberry Pi image is here. There is no current grabber activity from me. This may change but I'm concentrating on providing good QRSS signals instead on 3 bands. In the meantime, this site will remain a simple site with a few links for now. There may also be some occasionally useful files in the other directory that are of general purpose, and not QRSS related. I am a regular user and collector of the numerous cheap Chinese VHF / UHF handhelds. Some software for them is included here. I might also indulge in QRSS Grabber DXpeditions witha GPD Pocket PC and receiver in the near future. UPDATE - August 2018. I am experimenting with QRSSPig grabber software and it works very well. I am conducting feasability tests for a 600m band grabber. QRSS does not seems so prevalent on this band, existing grabbers are poor. Over the coming months, especially winter time I shall see if enthusiasm amongst the 600m band improves. If not then I wont bother. Radovan OK1FCX, a keen QRSS'er and software man has written a small script file for use with WGET. I have tested it on my Linux Mint 18.3 machine as a once off an it seems to work. You need to right click the properties and make it executable. The idea is to add it to a crontab and let it run automatically. Both end user and QRSS grabber compendium operators could adapt it accordingly. It also ensures that .jpg gets correctly added to each filename, unlike my own wget script file, that adds a serial number to each grab. Thanks Rad ! Possibly a new QRSS project ? I had an idea, the use of a syndicated QRSS grabber list for lazy QRSS Grabber Compendium websites. It's NOT meant to be a be all and end all solution, but only something to assist compendium websites of some form of automated list, or manaually edited list to ensure that grabber compendiums do not go out of date quickly. Other ideas include a simple RSS style feed for display on compendium sites, for grabber news or propagation events. Further democratisation could be multiple lists hosted by others and combined ? This stuff is up to enterprising compendium website owners, I'm just an idea man and a list maker ;-) We need more compendium / list makers ! Our community relies upon only a few people to run websites and lists and it is fragile. If an ISP or site goes down, we have little back up. Please consider helping. General QRSS synopsis 2018.Things are looking very good for this part of the hobby. 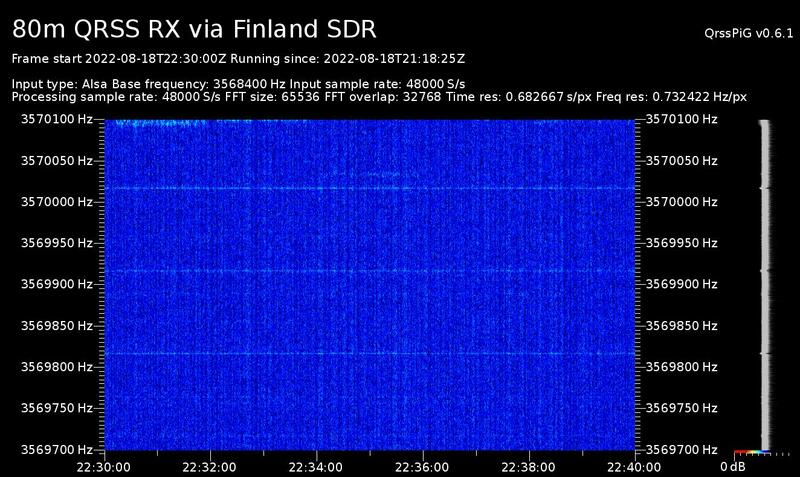 Despite the lack of sunspots, developments are taking place with new grabber software such as QRSSPig by Martin Herren for Linux, an all band super grabber from Dave WA5DJJ and LOTS of transmission activity from QRSS'ers. All this interest is bucking the trend. You can follow the latest news over here Knights QRSS group Dave is hoping to provide grabbers for the Lowfer, Medfer and Hifer community asap. The following text below comes from Eddie G3ZJO who has been working with QSL.NET to make sure that grabber files are passed without undue delay to the outside world. So when you use your grabber software, e.g. Argo or QRSS Pig, Lopora etc you MUST use the following filenames. Also, here's a link to SEQUENCEDOWNLOADER Handy for collecting all the screen grabs from various QRSS grabbers to your hard disk. Select new, copy and paste the link to the grabber picture and away you go ! An alternative for both the Linux and Windows world is to use the WGET command. WGET SCRIPT WGET is included in just about every Linux distro - if not then download it. There is a Windows verson available too. Life is easy with WGET.